Not only did Christ bear our sin; he sought to do so. Because he is setting the world right—remember, that’s what his righteousness means—he sought for the uncontested right to bear all sin. He knew that the only way sin could be eliminated was for him to bear it—for us to yield it to him. So he actively invites us to yield our sin to him. But we foolish human beings fail to permit him to do this. We keep believing either that we can bear other people’s sin ourselves (and thus pay the penalty of their sin in ourselves), or that we can get other people to bear their sin themselves (that is, we keep trying to get them to pay the penalty of the sin they sinned against us in hopes that that will make the sin go away). Equally foolish, some of us try to get Christ to bear our sins against him and others, but we insist that other people bear their own sins against us. This actually angers God particularly, because it shows that we don’t understand the nature of sin or what Christ is doing when he bears our sin. When we try to get Christ to bear our own sin while we simultaneously insist that others pay for their own sin, it shows God that our motives are all wrong. We’re focused on our own self-preservation. We’re not focused on Christ’s work of setting the world right. If we were, we would know that if we try to put someone’s sin back on them instead of redirecting that sin to Christ to bear, sin will just burn more holes—not only through our enemies, but probably through us again, too, and even more people. This is the message that Jesus shares with Peter in Matthew 18:21-22. Peter is talking to Jesus about forgiveness, and it’s clear that Peter doesn’t understand how forgiveness—God’s judgment plus God’s mercy, offered by us as Christ’s ambassadors—is God’s means of righteousness, of setting the world right. But Jesus says back to Peter, “No, not seven times. Seventy seven times!” Because Jesus’ focus is on setting the world right, not protecting himself. And he knows that forgiveness (God’s judgment plus God’s mercy) is God’s primary tool for accomplishing that purpose. So the goal is to use that tool as many times as possible, not as few times. And Jesus can tell that Peter and everybody else who is standing around them slack-jawed is confused by this, because they’re thinking about human forgiveness (which has no power to fix anything; it just delays and moves around the acid of sin and burns new holes in people). So he tells them a shocking and little-told story that’s designed to enable them to see the contrast between God’s forgiveness and human forgiveness. 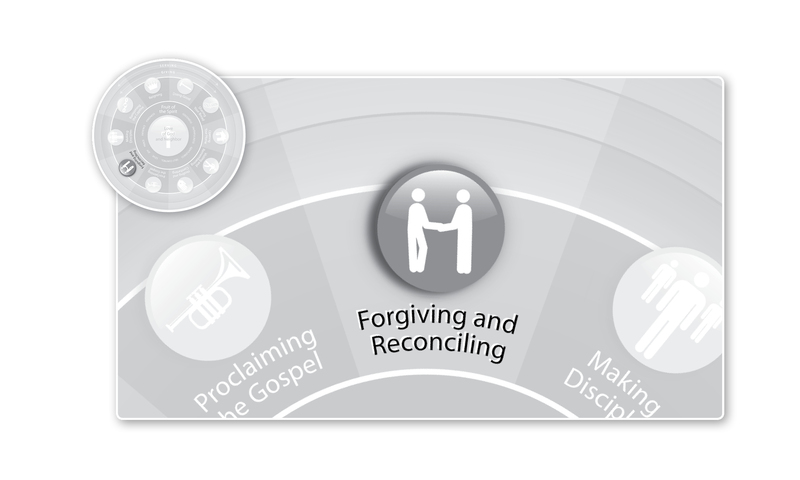 And that story is the focus of Part IX–the pivot point of our series on forgiving and reconciling. This entry was posted in Uncategorized and tagged Christianity, Discipleship, Forgiveness, Forgiving and Reconciling, Jesus, sin, Whole Life Offering. Bookmark the permalink.